As the premier waste removal service of the southern United States, Waste Pro has a unique workplace culture that guides how we support employees, interact with our customers, service our communities, and care for the environment. We understand the real strength behind our company is the individuals who make it up. That’s why we continually invest in the sustainable development of our organization and employees. We aim to attract and maintain a highly competent and competitively compensate workforce by offering one of the most comprehensive benefits package in the industry, annual bonuses and performance incentives. Experience the “Distinguishable Difference” of Waste Pro employment by applying today. In addition to earned wages, the total compensation package includes a benefits package designed to help our team members take care of their families and prepare for retirement. The following benefits are provided to our team members. Benefits include medical, dental, vision, preventative care, a nurse line with 24 hour access, a medical expense reimbursement program, employee assistance programs, long and short term disability insurance, accident/illness insurance, and more. Employees have the potential to receive a bonus of $250 per each year of service, along with our $10k Driver Award and $5k Helper award designed for drivers and helpers who meet specific criteria over a 3 year period. At Waste Pro, enjoy paid holidays and paid time off to spend with your friends and family. 401k savings plans are available to put you on a successful road to retirement. At Waste Pro we believe people make the difference. We are committed to helping our best become even better by offering training courses, leadership programs and promotion opportunities. Find your starting point, with the knowledge that at Waste Pro the potential to grow to the next level is unlimited. 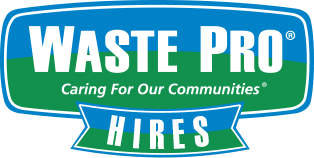 Waste Pro supports a diverse workforce & is a Drug Free Workplace & Equal Opportunity Employer. Waste Pro does not discriminate against individuals on the basis of race, creed, color, gender, religion, origin, age, disability, veteran status, pregnancy, marital status, citizenship status, sexual orientation, gender identity, genetic information, or any other classification protected by applicable laws. Waste Pro participates in E-Verify. In compliance with federal law, all candidates to whom a conditional offer of employment is made will be required to verify their identity and employment eligibility before beginning work at Waste Pro. Please read the attached notices for important information about E-Verify.